The Bunburyist: Clues 36.1: Christie, Conan Doyle, Green, Hammett, Silva, and more. 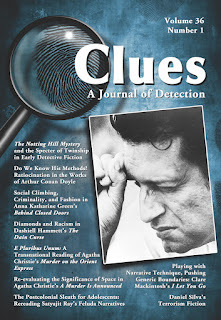 Clues 36.1: Christie, Conan Doyle, Green, Hammett, Silva, and more. 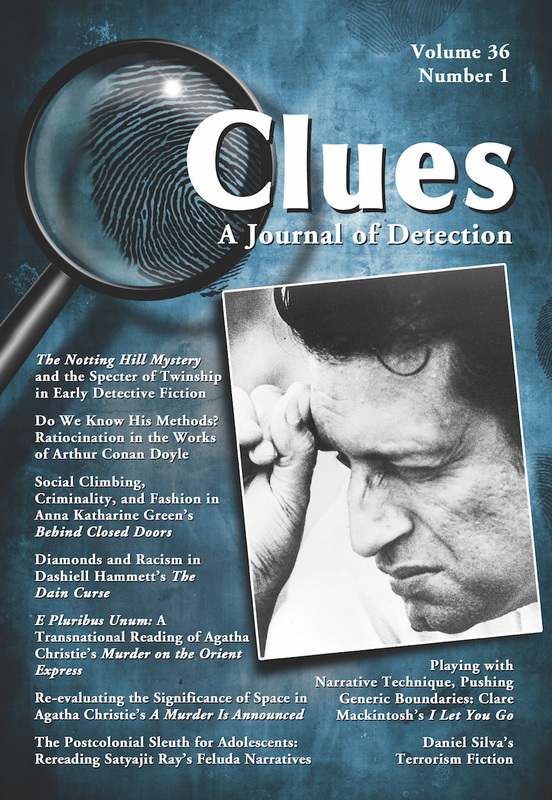 Clues 36.1 (2018) has been published; order the issue from McFarland. Abstracts are listed below. Updates, 3-24-18 and 6-16-18. The issue is now available on Google Play, Nook., and Kindle. This article questions both the Englishness and generic stasis ascribed to Agatha Christie and argues that her Murder on the Orient Express (1933) displays an inherent transnationalism that questions the strict taxonomies supposedly separating the English clue-puzzle from the American private-eye novel. The author discusses the nature of the village space and its influential role in plot, character, and structure of Agatha Christie’s A Murder Is Announced. The concept of psychogeography unearths the true nature of space and its influence on the construction and preservation of social identity in the book. This article discusses Arthur Conan Doyle’s explanation of Sherlock Holmes’s methods, contrasting them with his presentation of the detective in action. It explores contradictions in the Holmes stories, suggesting Conan Doyle’s investment in a hyperrational sleuth is at odds with his intuitive understanding of detective methodology. Clare Mackintosh’s I Let You Go (2014) challenges and disrupts narrative boundaries, subverting readers’ expectations and causing them to question what they had taken for granted. The book also destabilizes generic boundaries by veering away from the traditional whodunit and incorporating traits of confessional literature and social protest fiction. The author discusses the role of the social climber in Anna Katharine Green’s Behind Closed Doors (1888), examining the role played by costume and dress in facilitating social performance and upward social movement in nineteenth-century American society. Imposture and criminality are considered as well as the parameters of the authentic and inauthentic in a period of widespread conspicuous consumption and mass production. Twins appear remarkably often in early Victorian detective fiction. Charles Felix’s recently rediscovered Notting Hill Mystery (1865) illustrates that twins always run the risk of exceeding the grasp of the detective’s comprehension, as well as that of contemporary science, and were thus integral as heuristic aids in the genre’s formation. Written and published between Dashiell Hammett’s groundbreaking novels Red Harvest (1927) and The Maltese Falcon (1929), the controversial The Dain Curse (1928) has garnered little critical attention. However, the textual variants between the pulp installments and the Knopf publication—particularly elements related to racism—reveal that the novel is a significant fulcrum for understanding Hammett’s San Francisco. Well-known filmmaker Satyajit Ray (1921–92) created Bengali detective Feluda (aka Pradosh C. Mitter), who appears in a series of novels popular with young adult readers. This essay offers a postcolonial reading of select examples from Ray’s corpus. From Prince of Fire (2005) onward, author Daniel Silva examines different aspects of contemporary terrorism. This represents a refocusing of history in the making rather than the retrospection of his earlier novels, as historical circumstances contextualize his subjects from the Middle East to the new Russia and the trade in stolen artifacts. Shauna Wilton (University of Alberta) This article explores the emancipatory potential of the detective mother in the British television series Broadchurch and Happy Valley. It argues that, although mothers are often the objects of social and moral scrutiny, and detectives are often the agents enforcing social norms, the combination of these two roles in one character can both empower women and mothers as well as challenge stereotypical gender dichotomies. Audrey Parente. Once a Pulp Man: The Secret Life of Judson P. Philips as Hugh Pentecost.